Away from the village centers, the North Country is frozen at an odd point in development. The original farms of early settlers haven’t been completely removed, but not much development has continued past that point. Trailers were installed by the sides of hot-mix roads and everything stopped there. I’m fascinated to think what this area must have been like during the late 1940s—population returning as the nation demobilized, and those people changing things in the North Country. Things don’t seem to change as much now. Thank you! It was one of those evenings where I just knew I had to be out taking pictures! 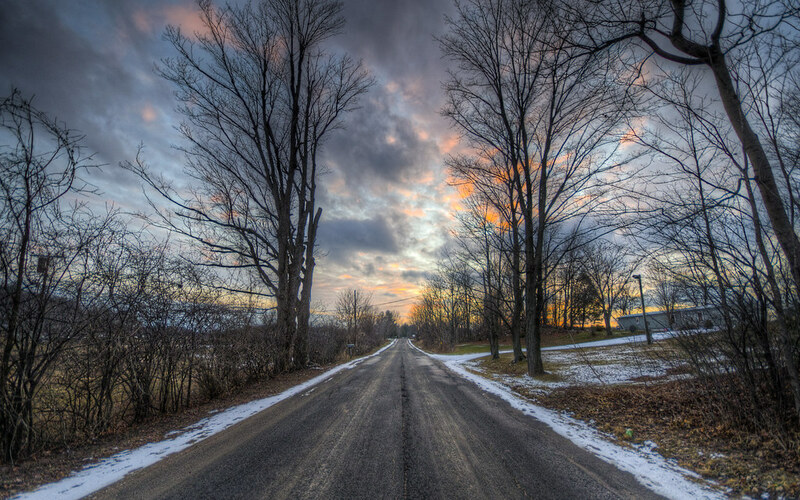 Love pictures of roads like that one! Me, too! Country roads are great. Very nice image. Yes, sometimes it does seem time stands still – frozen so to speak. Not much change in the North Country outside of the more populated, university and tourist areas. Not much money there for the small farmer/dairymen. How many are just hanging on? Most of the farms in the area seem to be of the family variety. There’s no interstate, so I think the big corporate farms aren’t too interested in coming in. There’s a pretty big community of Amish farmers who are hanging on. Yes, I can understand why there is little change. Particularly with the Amish farmers.